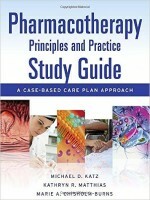 100 cases teach pharmacy students how to apply pharmaco therapeutic concepts to real-world clinical situations “Pharmacotherapy Principles and Practice Study Guide," Fourth Edition includes 100 patient cases that correspond to chapters in the fourth edition of "Pharmacotherapy" "Principles & Practice." These cases are presented in realistic fashion, using terms and abbreviations that would normally be found in a patient s medical record. Patients in these cases have drug therapy problems requiring identification and management. For each case, students will be asked to develop a Patient Database, Drug Therapy Worksheet, and Pharmacotherapy Care Plan, using the forms provided. With "Pharmacotherapy Principles and Practice Study Guide" students will learn how to navigate through the process of applying their knowledge of pharmacotherapy to specific patient cases by organizing patient data to logically assess a patient s medication issues and formulate a sound pharmacotherapy care plan.